Villa Maroma has it's own private pool and enormous terrace (see the video...https://youtu.be/MhBXZmQ7TaU) Set in an area of outstanding natural beauty, it has stunning uninterrupted views of Lake Vinuela and the mountains beyond. Furnished and equipped to a high standard the villa offers the ultimate in luxury and relaxation. The lounge, master bedroom and kitchen all open out on to a large partly covered terrace where you can wine and dine or just relax and soak up the sun with a cool refreshing drink! All bedrooms and the lounge are fitted with air conditioning/heating as well as four speed ceiling mounted cooling fans (if you prefer not to use air conditioning).The villa offers peace and tranquillity yet is only a 15 minute drive from Torre Del Mar with it's beach, bars and restaurants. Numerous traditional whitewashed villages surround the Lake and are easily accessible to explore. Villa Maroma, the perfect accommodation and location for the ultimate self catering experience. Our villa is approved by and registered with the Spanish Tourist Board (Ref CR/MA/00957). Golfers ! : There are two excellent 18 hole golf courses nearby- Baviera Golf, 15 mins drive, near Torre del Mar, Tel. 952 555 015 and Club Anoreta, 25 mins drive, near Rincon de la Vittoria, Tel. 952 404 000. Other Attractions: Caves at Nerja (35 mins), Alhambra Palace at Granada, Sierra Nevada (skiing in winter) (90 mins), Marbella and Peurto Banus with there many designer shops, swish bars and exclusive restaurants (75 mins). If your looking for somewhere peaceful, relaxing, spacious and with stunning lake and mountain views, Villa is for you! Our villa also has very easy access. Equipped to a very high standard, our villa is like home from home. Still need convincing?....read our guest reviews. As soon as we viewed the property we knew it was for us and of course, our guests! It has uninterrupted views of the lake and mountains and we just love the peace and tranquillity that surrounds the villa. We were also very impressed with the easy access, as many properties in the area are situated along long unmade roads. Our master bathroom is fully tiled, spacious and is equipped with full sized bath, shower (over the bath), wash basin, toilet and bidet. The en suite is equipped with shower, washbasin and toilet. Stunning views of the mountains, including Mount Maroma, after which our villa is named. Our nearest village is Los Romanes, about 5 mins drive or 40 mins walk. There are many other beautiful traditional Spanish whitewashed village within 20 mins drive. Stunning uninterrupted views of Lake Vinuela. Thermostatically controlled for maximum comfort. We provide both bathroom towels and beach towels, so no need to pack your own! Free wireless broadband for all our guests. Dining for six in the spacious dining kitchen. Outside dining on terrace (partly covered) for six with stunning views!! Large front balcony/terrace accessible from the lounge, kitchen and master bedroom. The balcony is partly shaded and has stunning uninterrupted views of the lake and mountains. Ideal for dining. Canoes are available for hire near Hotel La Vinuela, just 10 mins drive from the villa. Enormous pool terrace with stunning views and large front terrace directly accessible from the lounge, kitchen and master bedroom and again with stunning views. There are three golf courses within 30 mins drive from the villa. All on one level so very suitable for wheelchair guests. Our pool is on a spacious terrace with stunning lake and mountain views. The pool area also has a large awning giving plenty of shade (if required) during the day. Our property is all on one level. Furnished and equipped to a very high standard. Lounge has open wood burning fire boasts an enormous pool terrace with 7m x 4m pool. Lounge, kitchen and bedroom 1 open on to partly covered terrace overlooking the Lake. elle encore mieux que sur les photos. Bien sur la vue est magique, que la piscine avec sa douche est super, que l'environnement est parfait. We have stayed on Lake Vinuela before and it is just breathtaking! The area is just pure unspoiled vista. The villa was nice and clean and the new managers Ian & Debbie were very helpful when we needed help. My only negative comment is that there is very little shade during the day by the pool and whilst the canopy is there, you cannot all squeeze under unless packed like sardines or share loungers - not conducive to a relaxing afternoon I can tell you! I do think that investing in a decent parasol would make it perfect. There is a parasol base, but it is so heavy you cannot move it, but we did use the beach parasol there a few times and just moved the lounger about chasing the shade. One point to note is that it really is necessary to get at least some food shopping on the way from the airport as shops are closed on Sundays. The organic bakery in Los Romanes is fab and worth seeking out - especially their fruit & nut loaf for breakfast (best to reserve for the following day as they sell out quickly). Hotel Vinuela is really lovely for a nice evening meal - slightly more expensive than other restaurants but much cheaper than you'd pay in the UK for a top hotel meal. We were there on a jazz night and it was just lovely dining in the garden with fantastic service, live music and amazing food and wine (especially the local dessert wine). The watersports centre (Malaga-outdoor) at the lake was also really good - great value, fun and run by a lovely couple - nothing too much trouble. Many thanks Andy & Angela for the loan of your lovely villa. Thank you for your kind comments Mandy. We have noted your point regarding shade around the pool and there are now two extra large (3 metre diameter) parasols on the pool terrace. With regards Sunday shopping, there are two English mini market shops in Puente Don Manuel (10 mins drive from the villa) that are open on Sunday, where you can buy a selection of groceries. We look forward to welcoming you again to our villa sometime in the future. Just had a fantastic stay. Great views over The Lake and mountains. Everything In The House is Well functioning. 3 large sleeping rooms With aircon - Nice!. Large kitchen With all new owen, freezer etc. Great pool area also With fantastic views. The pool area is not Connected to The main terrasse so you have to go around The House. It works! It Would be great if The pool area had some more sunshade With a Big parasol or something like that. Thanks for your kind words Mikkel, have to confess, we've owned the villa for 14 years now and we never take that view for granted! Just to mention we had a very large wind out canopy fitted on the pool terrace which can be partially seen in a couple of our photos, it provides shade for at least four sunbeds for the entire day. We had a parasol with the table and chairs, however, being in the mountains, it can sometimes get windy and we lost it a number of times! We therefore fitted the canopy instead. There are also a couple of natural shaded areas on the terrace provided by the rubber plant and the villa itself. The property was spacious and well equipped. The views take your breath away. A perfect holiday! Thank you for your kind words John and glad to hear you and your family had an enjoyable stay. We look forward to perhaps welcoming you again sometime in the future. Two words: the views! I was really taken aback when we arrived at the villa - the scenery is simply breathtaking. This villa really does have such a beautiful outlook! Being in the London ratrace, my husband and I were keen to get away from it all and this place was perfect. We completely chilled out and we're already planning our next return. During the day we relaxed by the villa's pool or made the short trip down to Lake Vinuela where we had a picnic and a swim - it was so idyllic. The villa has absolutely everything you could possibly need and even inside the floor-to-ceiling windows make the most of the view too. There was lots to keep us entertained during our week-long stay; we loved Torre Del Mar for the quaint coffee shops, bars and shopping as well as the beach. The only thing is you do need a car but that wasn't a problem for us as it made it so much easier and convenient to get out and about. If you're unsure of which villa to go for as we were - I'd say without doubt this one as it more than exceeded our expectations. Thank you to Andy and Angela for answering any queries we had so promptly and for the fab stay in your beautiful villa - it really was a week of paradise and one of the best holiday's we've ever had. We will definitely be back! Approx 5 mins from Los Romanes, 10 mins from Alcaucin, 10 mins from Velez-Malaga, 15 mins from Torre Del Mar (nearest beach), 15 mins from Periana, 30 mins from Nerja, 40 mins from Malaga, 1 hour from Marbella/Puerto Banus, 90 mins from Granada. 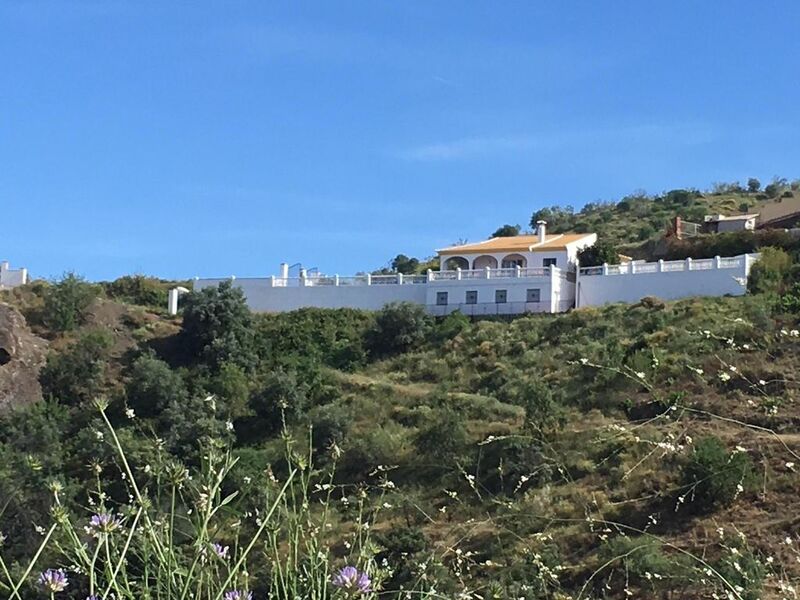 Note that the villa is available from 4pm on day of arrival and should be vacated by 10am on day of departure. In July and August bookings must be either 7, 14, 21 or 28 nights and must start/finish on a Saturday.